Who needs a free-scoring centre forward when you can get goals from all areas of the park? 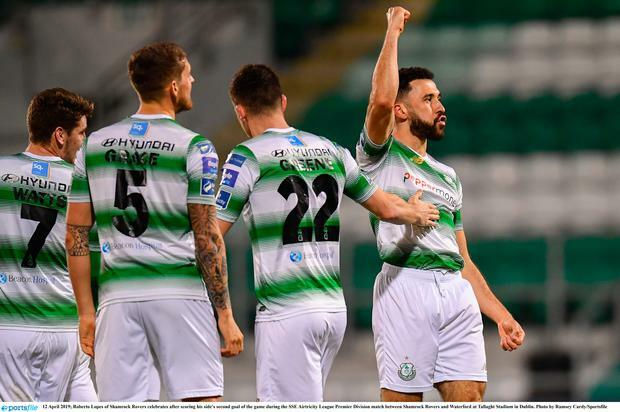 Shamrock Rovers are living proof that they can sustain a title tilt without a reliance on one man, as midfielder Sean Kavanagh and defender Roberto Lopes delivered the goals to earn a 2-1 win at home to Waterford, Rovers looking more and more like champions-elect with each passing week. But manager Bradley has enjoyed being able to poke fun at those who wondered about the balance of his squad as the midfield and defence have delivered time and again, and a 2-1 scoreline last night does not justify how much in control the home side were, Alan Mannus in the Hoops goal a passenger until Aaron Drinan nicked an injury time consolation goal. The win aside it was a very good night for Rovers as the side most likely to challenge them, Dundalk, lost for the second game in a row, that 13-point gap between the sides already looking like a chasm that cannot be bridged by the under-pressure champions. Rovers owned the ball for long spells as Waterford could just got get any relief, Finn going close with an effort on 60 minutes which needed a save from Connor, who was beaten again on 67 minutes, Lopes with a header from Byrne's corner, apart from a successful header by striker Drinan in injury time, the Blues offered no threat. Tests against the other sides in the top three (Derry City, Bohemians and Dundalk) are next up for Rovers: win those and that title will come even closer into view. S ROVERS – Mannus; O'Brien, Grace, Lopes, Clarke; Watts (Coustrain 68), McEneff; Byrne (B Kavanagh 86), Finn, S Kavanagh; Greene (Vojic 79). WATERFORD: Connor; Feely (Poynton 85), Kougoun, Delaney, Lynch; Hery (Akinade 67), Duggan; Chvedukas (Galvin 67), Lunney, Elbouzedi; Drinan.